We’d love your help. Let us know what’s wrong with this preview of Turkey by Jack Scott. In 2009, Jack Scott and his civil partner, Liam, sold off the family silver and jumped the good ship Blighty for Muslim Turkey. They parachuted into paradise with eyes firmly shut and hoped for the best. When the blindfolds were removed what they saw wasn’t pretty. They found themselves peering over the rim of a Byzantine bear pit. Bitching and pretension ruled the emigrey In 2009, Jack Scott and his civil partner, Liam, sold off the family silver and jumped the good ship Blighty for Muslim Turkey. They parachuted into paradise with eyes firmly shut and hoped for the best. When the blindfolds were removed what they saw wasn’t pretty. They found themselves peering over the rim of a Byzantine bear pit. Bitching and pretension ruled the emigrey roost. The white-washed ghettoes were populated by neo-colonial bar-room bores who hated the country they’d come from and hated the country they’d come to and were obsessed with property prices, pork products and street dogs. Expat life was village life where your business was everyone’s business. For Liam, it was the barren badlands of the lost and lonely. For Jack it was the last stand of the charmless Raj - 'Tenko' without the guards, the guns and the barbed wire. It took them a while to find their feet and separate the wheat from the chavs but, determined to stay the course, eventually they found diamonds in the rough and roses among the weeds. To ask other readers questions about Turkey, please sign up. Bite size observations and insights, on a Turkish life well lived. This aptly named book should be a lesson to all expats who try to integrate themselves in the local community head first without testing the waters first. 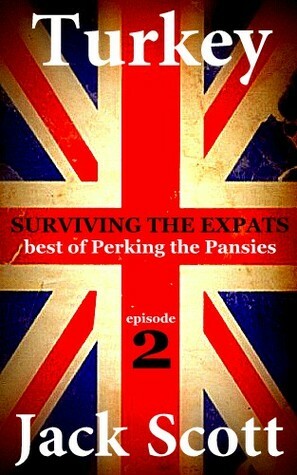 Turkey, Surviving the Expats centres around Jack and Liam's 6 month forary into the underbelly of expat endevours. Which was very quickly followed by another 6 months of trying to extricate themselves from that very same clique. If you've often yearned for an expat existence in Bite size observations and insights, on a Turkish life well lived. If you've often yearned for an expat existence in warmer climes, and wondered whether the reality could match you day dreams - this book is a bit of wake up call delivered with alarm bells ringing. It's a collection of pithy, amusing observations, which make you smile or cringe with recognition. It's also peppered with meaningful an unapologetic social commentary, and just enough personal insights to make you instantly warm to this foreign adventure. Jack Scott was born on a British army base in Canterbury, England in 1960 and spent part of his childhood in Malaysia as a ‘forces brat’. A fondness for men in uniforms quickly developed. At the age of eighteen and determined to dodge further education, Jack became a shop boy on Chelsea’s trendy King’s Road: ‘Days on the tills and nights on the tiles were the best probation for a young gay man abo Jack Scott was born on a British army base in Canterbury, England in 1960 and spent part of his childhood in Malaysia as a ‘forces brat’. A fondness for men in uniforms quickly developed. At the age of eighteen and determined to dodge further education, Jack became a shop boy on Chelsea’s trendy King’s Road: ‘Days on the tills and nights on the tiles were the best probation for a young gay man about town.’ After two carefree years, Jack swapped sales for security and got a sensible job in local government with a pension attached. By his late forties, passionately dissatisfied with suburban life and middle management, he and his husband Liam abandoned the sanctuary of liberal London for an uncertain future in Turkey. In 2010, Jack started an irreverent narrative about his new life and Perking the Pansies, the blog quickly became one of the most popular English language blogs in Turkey. Within a year, Jack had been featured in the Turkish National Press, had published numerous essays and articles in expat and travel magazines and contributed to the Huffington Post Union of Bloggers. As the blog developed a head of steam, a growing worldwide audience clamoured for a book. Jack duly obliged and his hilarious (well, he thinks so) memoir, Perking the Pansies hit the streets at Christmas 2011. The book became a critically acclaimed, award winning best seller and its success has opened out a whole new career for Jack as an author. Jack and Liam decided to end their Anatolian adventure and paddle back to Britain on the evening tide. They currently live in Norwich, a surprising cathedral city in eastern England.